Description: New genuine Acer ac power adapter charger. This adapter has a blue tip and is for Acer laptops only. Acer uses a few different brand adapters interchangeably. You will receive the latest version of this charger which may be Delta, Liteon or Chicony. Part #'s: ADP-90CD DB, ADP-90SB BB, PA-1900-24, AP.09001.003, AP.09001.004, AP.09001.005, AP.09001.009, AP.09001.010, AP.09001.013, AP.09001.027, AP.09003.002, AP.09003.004, AP.09003.006, AP.09003.009, AP.09003.011, AP.09003.020, AP.09003.021, AP.0900A.001, AP.0900A.005, AP.09006.005. 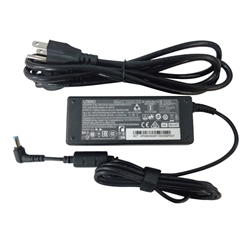 Compatible Models: All Acer laptops that use any of the adapter part #'s listed.